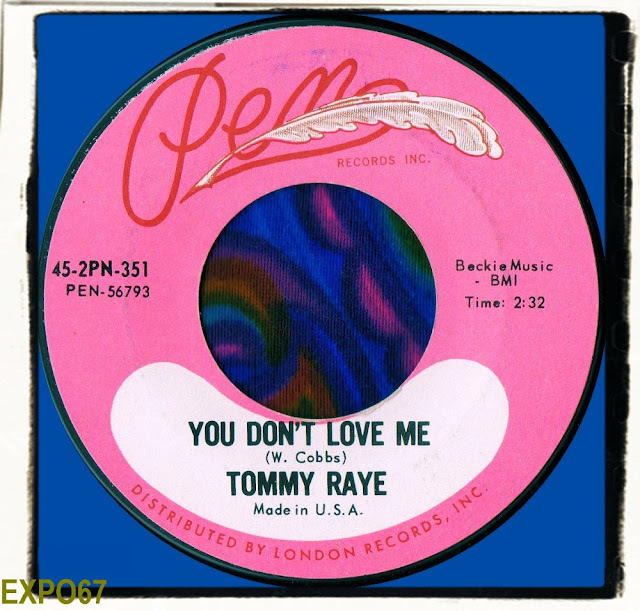 TOMMY RAYE - 'You Don't Love Me'/'Don't Let Me Be The Last to Know' (Pen Records 351) 196? I'm kind of out of my comfort zone with this 45 as I didn't know anything about Tommy Raye until I did some investigations today. It seems that Tommy sometimes went by the name of Tommy Tucker to confuse me even more. I know the song from Sonny & Cher. What I do know is best represented by my ears and feel for music. 'You Don't Know Me' is a solid mod R&B mover with some tasty guitar and organ interplay. Tommy's soulful vocals are just right for the laid back vibe, only he's singing about the fact that his girl doesn't love him anymore so maybe he should be sounding a bit more pissed off. Perhaps he's glad she's gonna do a runner? The songwriting credit is given to Willie Cobbs, he released his version of the song back in 1961. Truth is certainly stranger than fiction as we sometimes know and it appears than the originator of the song is Bo Diddley. He wrote the song but it's original title was 'She's Fine, She's Mine' releasing it on Checker Records back in 1955. Pen Records operated out of Memphis Tennessee. I'm not sure if Tommy Raye had this released on XL Records first, then on Pen Records but I'm sure those with a better knowledge than me will confirm one way or the other. the gary walker version is my fave! Advertised in Billboard July 11, 1964. It entered the Cash Box single chart (looking ahead) as #143 on August 8, 1964 (peaking the following week at #141).